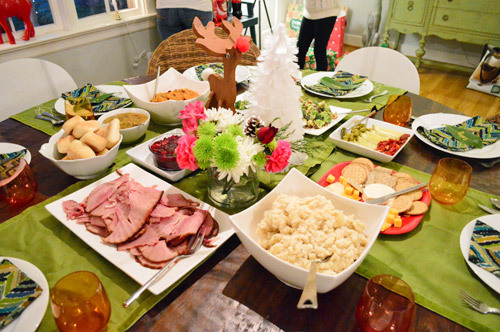 You’re cordially invited to our first ever Christmas dinner! There were 15 people here in total (and 4 of them were under the age of four) so it was lively and our house felt full in the best possible way. Not only did we not set the house on fire, we didn’t even burn the ham. Cue the collective sigh of relief. Actually, although we’ve hosted Clara’s birthday party last year & the year before (oh yeah and our wedding) they were all outside – so this was the first time we’ve had a big inside gathering. I kinda went into it worried that we’d be bad hosts/wouldn’t have any fun, but it was truly awesome. Really. Not just saying that. We had fun pulling out a few simple and affordable stops to make everything feel festive without spending much money/time – and we even learned a few tips along the way (aw yeah, there’s gonna be a bulleted list up in here). In summary: it wasn’t that scary. Plus I got to break out my cloth napkins. Not gonna lie, I’m a giant nerd for that. Oh yes, and that chandelier in the dining room is new so we have to spill those beans soon. In the meantime, let’s focus on the party. I played around with a few different centerpiece ideas (three different feather trees = too tall & face-blocking, a group of silver candlesticks = not enough color) before finally landing on this little trio. Nothing was too tall to block the view across, but thanks to the little white feather tree, some fresh flowers (which John surprised me with after a grocery store run), and a very special homemade reindeer, it was casual, fun, and most of all meaningful for the family. See, that reindeer was actually made by John’s late grandfather, so everyone who saw it commented about how great it was to have him with us at the table. And since the stuff in the middle of the table didn’t take up much of a footprint (our whopper of a round table is 72″ across) there was still plenty of room for all the serving dishes to be set down and for food to easily be passed around. 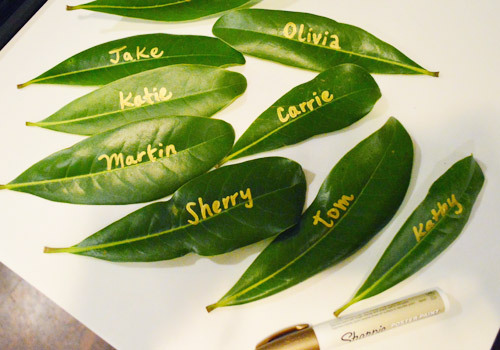 I thought some casual place cards to help people with seating might be nice (I like to be told where to sit at parties so I don’t commit some accidental faux pas and sit in the wrong place), so I plucked a few nice glossy leaves off the magnolia tree in our front yard, rinsed them thoroughly, and scribbled every guest’s name on one with a gold sharpie paint pen that we already had in our craft drawer. Total time spent: six minutes. Seriously, I looked at the clock. As for how the seating worked, we had seating for eight people at our dining table (we alternated between white bentwood chairs that usually live in the living room and four of our normal dining chairs so everyone had some nice elbow room) and three more spots at the nearby kitchen peninsula, while the little kids sat at the kids table that we set up behind them. They even had little crayons and color-able place mats (thanks Dollar Spot at Target) which kept ’em seated for just a few minutes longer so we could all scarf a little more food. Update: And as for the people at the peninsula, it ended up just being our 14 & 12 year old niece, who were happy to be at “the cool kid’s table” (John’s sister ended up tending to a restless one-year old, so she offered up her spot at the table to me since I had planned to sit at the peninsula to be near the kitchen and grab things for people). I just scarfed my meal at the table and then Katie came in and got to sit down and enjoy hers. Three cheers for staying flexible! Here’s a better shot of the kid’s table (minus the last two chairs that we brought in right before everyone showed up). I think they had the best spot, right under the chimney. It seemed especially appropriate for Christmas. But now that you’ve seen the table all set up and ready for guests…. bring on the food! Our family always does pot-luck-ish gatherings for major holidays, so John and I covered the ham, a few appetizers, the beverages, and some dessert while family members each brought along their specialty side dish (which meant we ended up with sweet potatoes, cranberry sauce, mashed potatoes, homemade gravy, a cheese plate, and a yummy broccoli-cheese dish). Oh and see the platters and bowls? I set them all out when I set the table a few days in advance (it was easy to count what was coming and make sure we had the right container on hand for each item). Then it was just auto-pilot when it came to setting things out that night when people arrived. As for where we got stuff, the serving platters/bowls were all from HomeGoods, purchased over time (I got 2 large rectangular dishes last year, 2 large square bowls the year before, etc). It was actually pretty surprising that we didn’t have to buy any extra serving stuff (the largest “dinner thing” we had before this has was eight people and we ordered pizza sans silverware – so it’s safe to say we’re no pros). 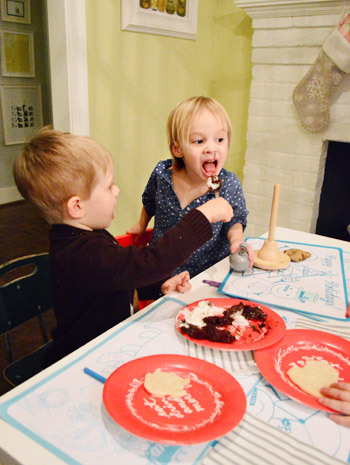 But even things like the old green Pottery Barn runners have been ours for years (we used to break them out in our first house) and the little reddish cups were leftovers from Clara’s party. Use whatcha got, right? Gratuitous bar-cart shot. 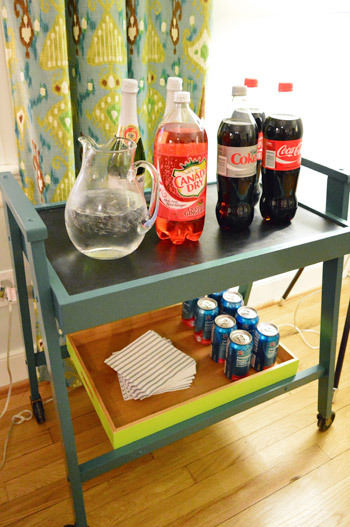 Mad Men, it’s not – but it was fun to break out secret book project #5 (the cart) just for the practicality of serving up things like apple cider, ice water, soda, flavored seltzer, and wine (that got broken out after this photo was snapped). We debated putting a tub of ice on the bar cart or even placing everyone’s glasses there, but in the end we just set the table with the cups at each person’s plate and left the ice in the ice maker and everyone seemed to have no trouble grabbing their glass, getting ice if they wanted it, and pouring themselves a drink. We must be a family of do-it-yourselfers, haha. For dessert we had homemade cookies, ice cream, and an awesomely chocolatey yule log. Here’s Clara and her cousin John demonstrating that sharing holiday spirit. I love her chocolate-sauced face and how John opens his mouth while feeding her. It wasn’t all place settings and food-scarfing. 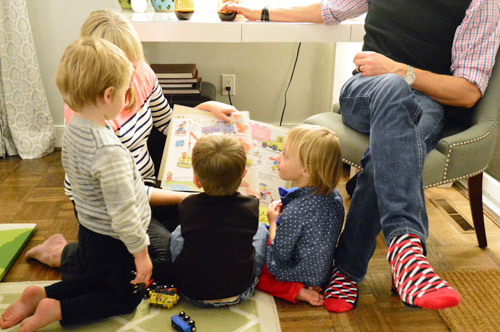 There was definitely a lot of kiddo fun, like this reading session in the corner of our living room (are Todd’s socks not fantastically festive?). 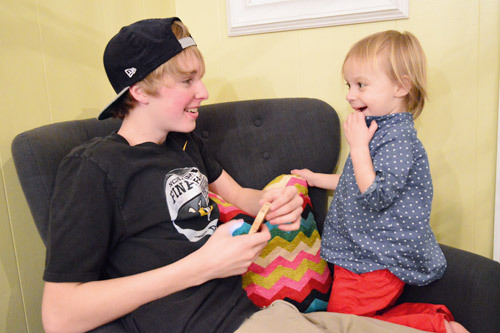 And Clara logged some quality time with her older cousin Jake. We also exchanged presents after dinner. Here I am in the background beaming at John. It was awesome to have everyone over at our house. I was dorkily giddy the entire time. 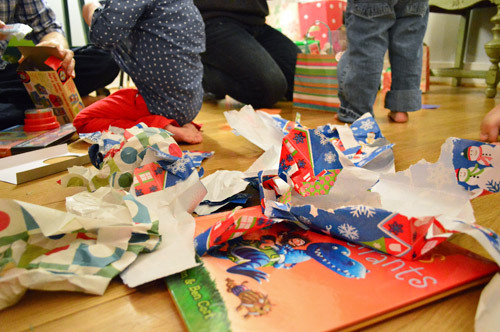 Ah, the beautiful chaos of gift-opening. The kids were so excited about every last book, shirt, and toy that they received. It was very sweet. 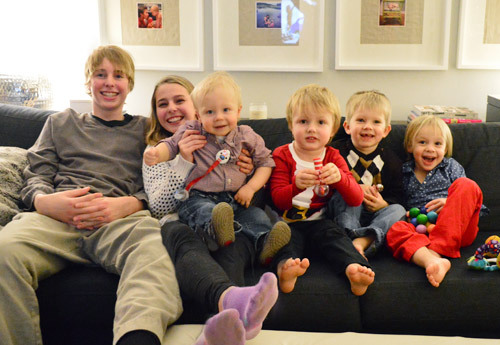 And speaking of the kids, here they are all lined up on our couch. That’s Jake and Olivia on the left, Ben’s in Olivia’s arms, and then there’s Emanuel, John, and Clara. The fact that no one’s crying? Unexplainable. But priceless. Food Plan In Advance. About two weeks in advance we planned the menu (in general, we prefer to break all bigger “projects” down into smaller bite sized tasks and tackle them over time – you know, instead of freaking out at the end and having to toss everything together in a mad dash). Set The Table Ahead Of Time Too. About two days in advance I set the table. Since I knew what we’d be serving and what family members would be bringing I could set out the right amount of large bowls, large platters, smaller bowls, etc (once again, doing this ahead of time was a nice way to check off some other boxes before the day of – and to help me sleep better knowing more had been accomplished). Remove Bad Bait. The morning of the party, I sifted through all of Clara’s toys for anything that might not be all-kids-friendly (ex: delicate dollhouse furniture that Clara’s gentle with but another kiddo might not be, anything big/heavy that could be lobbed at another child, anything that kids could fight over like one rolling cart that everyone might want at once). I tried just to leave things out that all 4 kids could play with together (like the big box of duplo leggos, Clara’s kitchen full of play food, and her train board – since they all have enough “moving pieces” for everyone to share). Lock It Down. All of those items that I systematically removed from play were shoved into the playroom, which is also full of other not-kid-friendly items like piles of furniture and accessories that are waiting to be refinished. Then, for peace of mind, John and I just locked the playroom door so no one could run back there and get hurt or grab those out-of-play toys while we were distracted in the kitchen or dining room. Worked like a charm. Allow For Last Minute Touches. In the final hour I added those personalized leaf place cards, so I was glad I had some time to putter around instead of not being as prepared in advance (which probably would have led to “why isn’t there more time?” stress when I couldn’t execute those last minute ideas). Take Precautions When You Can. 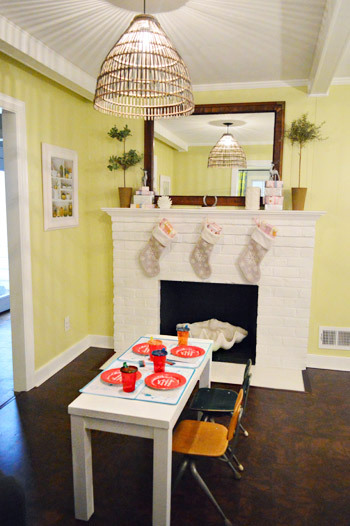 We didn’t want to be hosts who worried about stains & spills, so we removed the rug that usually sits on the floor in front of the fireplace (nothing like a kid’s table sitting right on top of a light colored rug) and stashed it in the playroom. We also set out white & silver paper napkins at the kids table (not bright red/green ones) since a few helpful commenters explained how those can stain if people use them to scrub a spill in a rug, curtain, or carpet (the dye can bleed and make everything worse). That’s it! But there are tons of other awesome tips in the comment section of this post. Y’all are smart. Hope you all had the happiest of holidays! Did anyone else host? What did you serve? Was there dancing and caroling or just eating and gift-exchanging? Did you break out the cloth napkins? Did your children spoon feed each other desert? Do tell. Are those big chairs comfortable to eat in? It seems like you’d never be able to lean back because they’d take you too far away from the table. Oh yes, we eat in them most nights on our own (and I’m only 5’2″ but I don’t have any issues). I had no idea that your table was that huge until I saw the shot of everyone sitting at it. I could nap on that thing! Well done, everything looks beautiful! Oh yeah, seriously I’m only around 62″ tall and the table is 72″! You caught Grandma Kathy in a rare moment without a smile on her face. LOVE her peppermint sweatshirt! The FESTIVE FEAST looks fantastic. Decor is to die for! GREAT JOB, Sherry, John, Clara, and Burger! Haha, it’s true! She’s always smiling and her Christmas sweaters are the best! Hey!! You’ve got light! Fantastic, Happy New Year! Those light fixtures are amazing. I will, someday soon, convince my ceiling-fan-loving husband that they all need to go. Nailed it! The setup looked great and the guests looked happy! We started a new Christmas dinner tradition this year (following last year’s major letdown of a 15 minute meal after I tortured myself for weeks with plans/prepping and then all day cooking) of shrimp-n-grits. It was awesome. I only spent an hour in the kitchen and everyone was very complimentary of the outcome (unlike last year… sad face). Looks like you may have a new tradition started too! Great job! Looks like your Christmas was awesome!!! 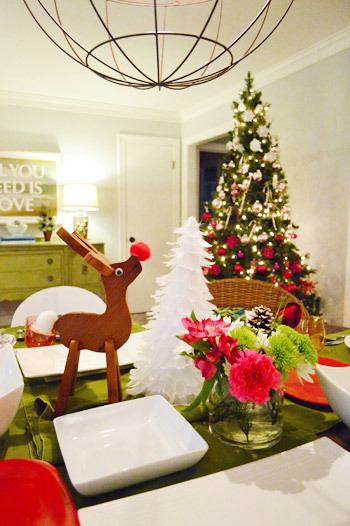 Love the table setting and the bulleted list, too! Can’t wait to hear all about the new Chandelier! Is it from Joss and Main? Thought I saw it recently on one of their events…. so curious! Nope, it’s not from there… more details soon! Definitely still in love. It’s very comfy and holding up so well to a kid and a dog. No complaints at all! WOW. Your table really is massive! That’s awesome for big family get togethers. The light is super exciting. Love the shadows it casts on your ceiling. Wonderful!!! I have hosted few times, and have learned as I go. It gets easier, and hard to believe how relaxing I can be with all of the prep done ahead of time. Random question: I’ve noticed a difference in author “signature” on YHL and YoungHouse Life. Adding your last name for one blog, and not the other? We hosted Christmas for the first time this year too! For my bridal shower, my aunt gave me a HUGE set of Christmas dishes, we got to use our M monogrammed cloth napkins, Chris made his famous lasagna for dinner and we opened gifts at 1:30 am when his sister and niece arrived! A little non-traditional, but it was a perfect day! Is it me or does Clara’s cousin Jake look just like his Grandpa?! What a lovely job you guys did as hosts! There’s definitely some family resemblance! Fabulous post and great PRACTICAL entertaining ideas! Can you please give details on the pillow that is on the chair (Jake and Clara are in the photo)? I LOVE it. Happy New Year! Here’s hoping that 2013 brings you all continued health, fun, and joy! Oh yes that was one of my Christmas presents from John! More details soon! We have to write up a whole what-we-got-each-other roundup! I was wondering the same thing!! Looking forward to that post! I love that table and the fact that you are so darn organized!! Hahahahaha love that guest appearance! Looks like a lovely time. 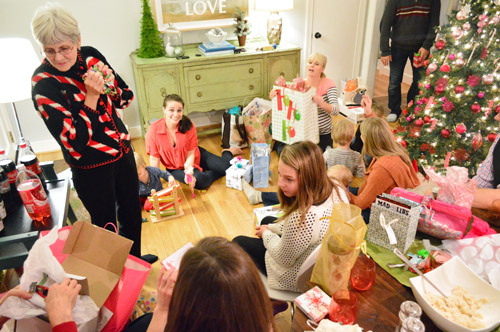 Big family Christmases are the absolute best! My grandma always hosted us 12 grandkids (the oldest is now 30 and the youngest is 17, so I’ll let someone else do the math of how many toddler-age youngins’ we had running around at one point) and then there was usually 12 to 16 adults…so yeah, it was quite the large bunch she had to entertain and cook breakfast & dinner for (Christmas for us is an all day event, like 9 AM to 1 AM). My dear Aunt Jayne has now taken on those duties, bless her soul (and enormous house to accommodate us). The big event at our Christmas celebration this year was playing games. We played about 25 rounds of Christmas Bingo where the prizes served as our gift exchange, Boxers or Briefs (which is super hilarious and has nothing to do with undergarments), and probably six straight hours of The Game of Things (which now with all us being adults and of drinking age got hilariously vulgar…and I learned more about my family than I probably ever wanted to know). I don’t think I have ever laughed so hard in my entire life that I did that night. That sounds like so much fun! Love those traditions! Thank you for all of the wonderful tips! 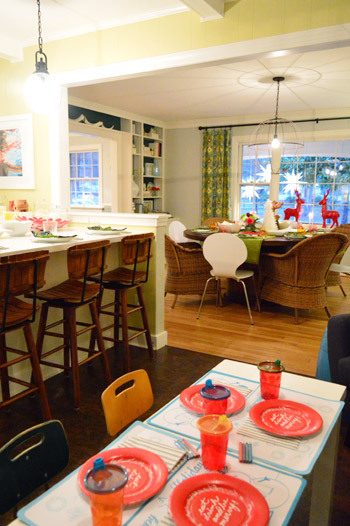 i live in DC and was so sad to miss you guys at that living social event….i hope you come back…esp bc that fab book of yours is sold out (nice work) :) can you please tell me where you got the kids table and chairs from? thank you! here’s to an especially crafty 2013! 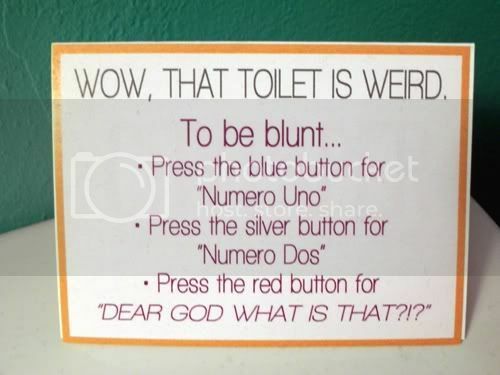 Aside from the usual inspiration I always get from you guys (ie: plan ahead and be organized, because I am that person still wiping down a toilet when the doorbell is ringing) I have to thank you for the red napkin-dye-danger tip you shared – I missed it in the comments and I honestly never thought about it! Glad you had a great holiday!! I was actually running last minute errands in your neck of the woods on Christmas Eve – in town to see the in-laws – and I have to admit that I always had one eye peeled in case there was a random Petersik sighting. Obvioiusly, you two were already done shopping, I am sure. LOL! Aw you’re so sweet! Hope we bump into you around town soon! I feel like I need a bullet list to mention all the things I love! It was just us for Christmas but we do use our cloth napkins every day (I even made a bunch of them for about 50 cents each after finding some nice, grey clearanced fabric). Hahahaha I love that Emily is modeling Sue in that shot. Cracked us up. LOVE the new chandelier in the DR! You must spill the beans! Can’t wait to hear more about your chandelier. I was all worried I had missed the post on it for a hot minute (never!!). So glad it all went off without a hitch and beautifully. Way to end 2012 with a bang. I love it! I feel the warmth and festivity exuding through the post. Great to hear you had a wonderful Christmas, and that “we” were a little part in making it happen (with our tips from that post). It honestly looks as if you’d been entertaining that amount of folks regularly for years… everything simple and simply great! I wish you all the best for the coming year, health, happiness, and a lot of DIY! P.S. Absolutely diggin’ the light, such awesome shodows it casts! Aw thanks so much Syl!! Love your new light!!! I have been looking at one similiar for my kitchen area too. I also love your new chevron pillow from John… Can’t believe he caved to the addiction hahaha. It’s a Christmas miracle! Happy New Year. We went to Mom’s house but were in charge of breakfast Christmas morning. Talk about pressure- omelet rolls ups & a Christmas tree cinnamon bun tree! Looks like such a great time. How did you decide who would sit in the other room? Did you worry that they would feel left out? It’s just a few steps away to the peninsula so we put the big kids there (Jake and Olivia are 14 and 12, so they actually like to be far away from the boring adults, haha). Haha yes, definitely meant soda! It looks like you all had a fantastic christmas! who is the lady looking resplendent in the candy cane jumper? I LOVE IT!! That’s John’s mom. She has the best Christmas sweaters! I am completely bookmarking this post! 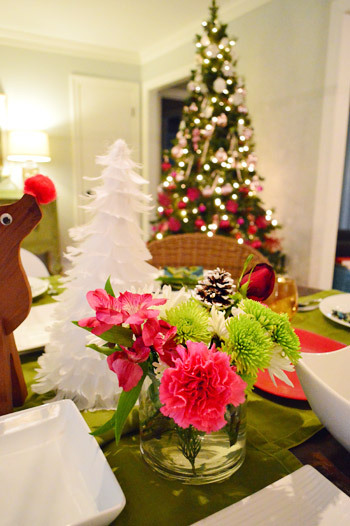 We’re hosting our first Christmas dinner in 2013 (yikes!) and I feel like this will help keep me on track! 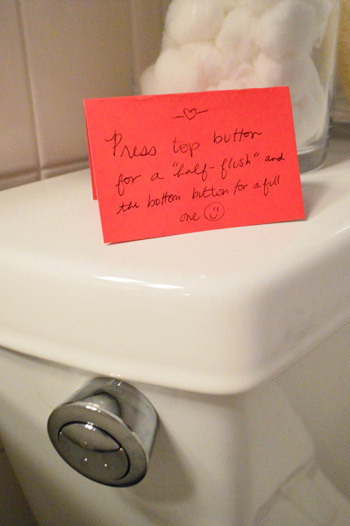 I’m also so happy I’m not the only one with a “how-to” note on our dual-flush toilet! 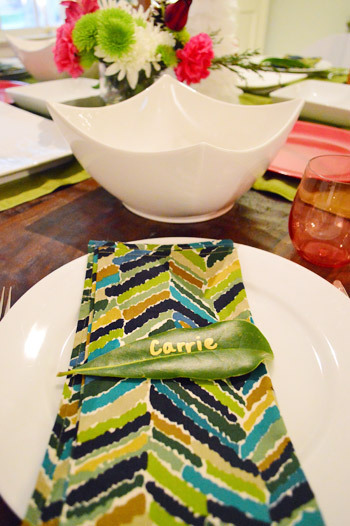 Cloth napkins are not just for Christmas anymore! My kids pressured me into going cloth years ago to cut down on paper waste and we’ve never looked back. I have a great collection that get hung by the set on skirt hangers when not in use. Some of my favorites came from thrift stores where I’m always on the look out for more. Those same kids that first pressured me into using cloth so long ago have children of their own, so when I’m thrifting, I watch for darker colors and textures to camouflage stains to give to them! PS – got your book for Christmas and am enjoying looking through it! Nice going! I am thinking of making a play kitchen for my boys(you folks totally inspired us). Can you recommend a good jigsaw to make hole for the bowls?. Please also suggest other tools that might be required. A jigsaw and a pencil to trace the opening should be all you need. We just have a jigsaw by Ryobi from Home Depot I think. Love everything about this post! How fun to see your family gathered together like that. I think that is my favorite thing about the holidays. Thanks for all the great tips! Planning a menu ahead of time really is the biggest stress saver for me! Great job you guys! I love the magnolia leaf place cards. 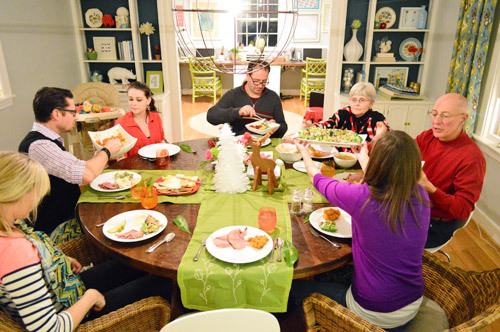 This was our second time to host a big family holiday dinner. We had 22 people (that included hubby and I) at our house. I sort of have a thing for tables and I had been searching for a nice drop leaf table for a while (read: several years) in a miserly price range -$150 or less. I hit the jackpot about a month before Christmas, when I found one for $75 on craigslist. Gotta love Sir Craig and his list, right? Our c/l find came with 4 extra leaves and expanded to seat 10! And with our other two dining tables seating 6 each, everyone was able to be seated around a table. My only complaint and suggestion to everyone else: make sure you leave yourself time to take pictures or assign someone else that task -as we don’t have a single picture of that afternoon and as hostess I was too busy to take care of that myself. So awesome about the table! And great advice! It looks like all your guests took off their shoes. We don’t wear our shoes in the house but I always feel too awkward to ask guests to remove their shoes. I really want them to especially since our crawling daughter has been known to lick the floor. :) How do you handle it? This is delightful! I can’t wait until we have a bigger home/dining area so we can host family dinners. We hosted a holiday party for about 40 (!) friends at our place this year, though. It was cozy, but super fun. Yay! So glad it came off without a hitch…maybe now you guys will be confident enough to do some more hosting/entertaining posts. Is it just my weird mind, or did Clara get a wooden toy plunger for Christmas?! Haha! That was actually a fun farm animal game. So glad it went well and that y’all had so much fun in the process. We have everyone over for soup and appetizers on Christmas Eve (24 guests this year!). When we first hosted we didn’t know it would become a tradition. This was our 14th year, I think, and it just gets more and more fun each year. Thanks for sharing — all the best to you and yours for 2013! Congratulations! This actually looks like a lot of fun, rather than a lot of stress, which is totally inspiring. And what a beautiful family you all make! Happiest new year’s wishes to you all. I LOVE the white chairs with the rattan chairs, looks awesome! 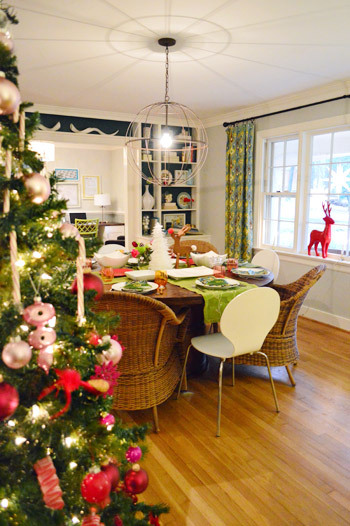 Isn’t it tiring and fun hosting family for holidays. Here’s to many more for you guys! My husband and I are getting ready to host our fourth (4th!) event of the Christmas season, and I’m slightly in awe of how easy you make it look. I always need an extra hour in my schedule to really feel relaxed and on top of things, but it all works out. It helps that our house is very flexible and that we can just shove our furniture around to expand or contract seating. Looks like everyone had a great time and your house looked awesome! Did you change the photos in your living room frames to instagram photos? Oh yes more on that little update soon!